Immerse yourself in a CHILL whole body cryotherapy treatment. Using our Impact Cryosauna (read more here about why we love Impact Cryo), your body will be exposed to temperatures of -110 Celsius (-166 degrees Fahrenheit) to -130 Celsius (-202 degrees Fahrenheit) in order to promote overall health, fitness, weight loss, recovery, as well as beauty. A single refreshing three minute session promotes the natural healing process. It’s a fast and effective alternative to traditional ice baths. Impact’s patent-pending whole body cryosauna cryo chamber fills with nitrogen vapor and drops the ambient temperature to a range of -110° Celsius (-166°F) to -130° Celsius (-202°F). 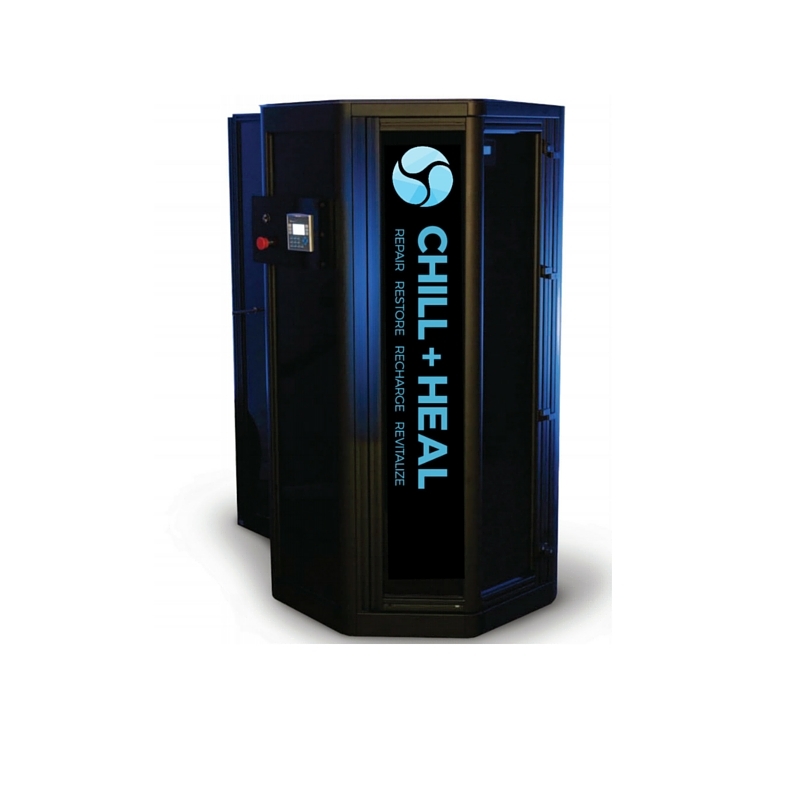 This temporary dry chill surrounds your body and cues your evolutionary bio-response to cold. The three-minute session provides an invigorating experience and promotes natural healing. Athletes enjoy cryotherapy because of the quick post workout recovery and the pre workout adrenalin they feel it produces. Get that “youthful” feeling back with the beautification benefits of Whole Body Cryotherapy. Cryotherapy sessions get down to -130 degrees Celsius (-202 Fahrenheit) and clients have reported that the penetrating cold helps not only collagen production, but firming and tightening of the skin as well. By briefly freezing the out layer of the skin, the natural collagen production gets disrupted and reacts by creating more collagen. This increased production of collagen results in the skin regaining elasticity and appearing younger and smoother. Not only that, but clients have reported that cryotherapy also helps with decreased skin blemishes, and some clients report stronger and longer hair and nails. Just like after a great workout or a long run, some clients say you could feel euphoric and energized for up to 8 hours. It’s also not unheard of to have a deeper and more restful sleep following cryotherapy sessions. Deeper sleep allows you to recharge as well as improves your overall mood and well being. For best results you should initially have 8-10 treatments over a period of one month. Once you feel renewed energy, and a more restful sleep, you will want to make Whole Body Cryotherapy part of your routine. We will work with you based on your reasons for seeking cryotherapy to help tailor a specific plan for maintenance.